Hello! Today, Smak Parlour visited Philadelphia University's campus for an event run by StyleLine (the school's fashion journalism club of which I am a part of). 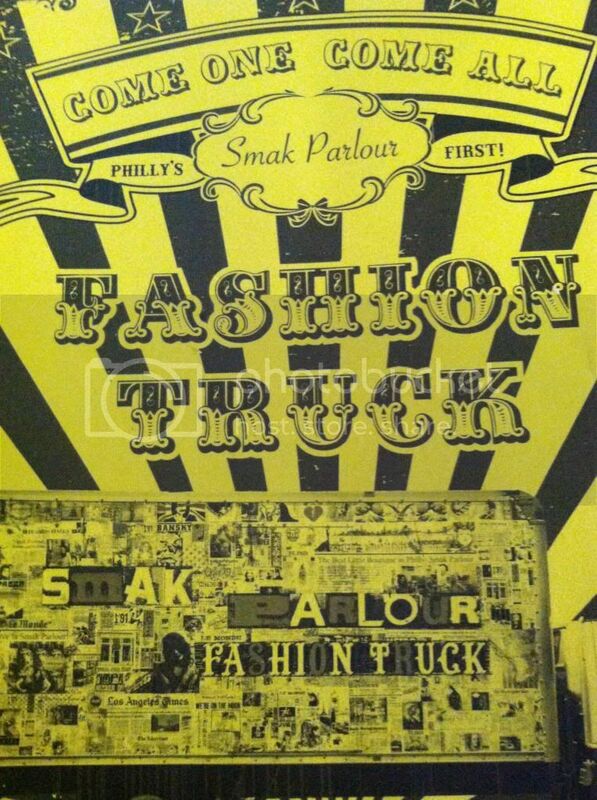 Smak Parlour is a fashion truck that sells women's clothing and accessories. Although, I didn't get a chance to stop in the truck today (I just managed to pose for some photos next to the truck), I did get a chance to stop in last week when it previously visited. And let me just say that it was such a cool experience. The whole idea of a fashion truck is extremely appealing to me. I'm not sure what the huge draw is considering that a fashion truck is essentially just a truck full of stylish clothing and accessories. But I guess the fact that fashion trucks are mobile and frequently move to different areas really captivates me. And everything inside the Smak Parlour truck was arranged so neatly! Not to mention, Smak Parlour had some wonderful merchandise selling everything ranging from inexpensive bandeaus to edgy jackets to sweet dresses. If I wasn't a broke college student, I would have definitely purchased something from Smak Parlour! Have any of you ever been inside a fashion truck before? cute outfit. love the blazer!